This is my go-to frame for almost all of my art. excellent quality. showcases contemporary art beautifully. looks just as good as any custom framing (if not better ) that i have ever seen. The free samples arrived quickly and are very helpful in choosing colors. This was the only affordable floating frame I could find for a 1 5/8 canvas that could be made to custom size. My frame order was filled and arrived very quickly and was well packed. Very satisfied with the quality. I chose the silver leaf and it really is a terrific looking frame. I didn't expect to find so many noticeable marks or scratch like marks within the surface Of the frame. It was on our first frame. I've ordered more because I feel the frames have qualities I appreciate. If I sound picky.. It's because I am. Anita we appreciate your feedback. The frame has silver leaf overlay on top of the wood which is a 'gesso' finish. 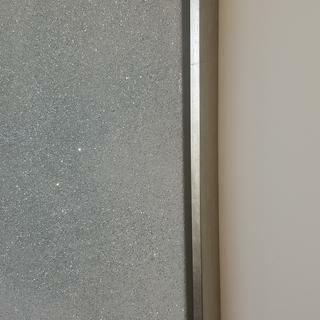 However, the finish should not have scratches or marks. We would like to replace the frame for you since there are visible defects. Could you please email us a photo of the frame so that we can investigate the issue with the finish on the frame? We can be reached by email at customercare@pictureframes.com- Attention Shea or give us a call at 1-800-332-8884. Thank you again for your business. Fantastic frame for the wrapped canvas my client bought. the frame makes the art look like it should be in a gallery, not at HomeGoods. We loved the frame! It is perfect with the canvas and painting it frames! Way too expensive for the quality! Very disappointed in these frames. They damage extremely easily and my canvas still has gaps on the sides where I feel the canvas should fit like a glove inside the floater. Not worth the money. Also I think they should come with blocks or foam core since you have to bring the painting/canvas out to sit in the frame right since it looks ridiculous if it is pushed flush to the back of the floater. Hello Connie. Thank you for taking the time to submit your review. We can hopefully find a viable solution for the issues you have expressed. If the frame arrived damaged, we are pleased to send you a replacement at no additional cost to you. Could you please email us photos of the damage? We are also happy to exchange the frame since the size is not suitable for your canvas. You are absolutely right in saying the canvas should "fit like a glove" inside the floater frame. The feedback regarding the blocks or foam core being provided with the frames is a great suggestion. I will most certainly pass that feedback to our Production Team. Typically, customers use the cardboard the frame arrived in as a space filler. Using the cardboard is also environmentally friendly and is very much like foam core. I will give you a call today to see which solution is best for you. Thank you again. Cheap. Horrible customer service. Damaged shipment. Shipping was SUPER expensive and I got damaged products. Highly disappointed. Packaging tape during shipping frames pulled paint off the frames. Hello Robyn. Thank you for taking the time to speak with me today over the phone. We sincerely apologize again for the damaged that occurred during transit. As we discussed, we are happy to replace the frames once you email us the photos of the damage and document each size. When you have the opportunity to email the photos, we can proceed with a resolution. We look forward to making this right with you. Thank you so much for your business! Hi Patricia. Thank you for your review. We regret to hear that the hardware did not arrive with your order. This is certainly not an experience we wish for you to have. In these cases, our customer care team is always happy to send out the hardware needed to complete your order. They can be reached at 1-800-332-8884 and are available Monday-Friday 8am-7pm eastern time. We appreciate your business and hope to serve you better in the future! Looks beautiful! Just as I hoped....easy to assemble as well. The corners were 100% perfectly assembled. The finish quality was excellent. The packaging for sending it couldn't have been any better. The shipping time was reasonable. The shipping charge did seem a little high but I do realize costs are going up for USPS, UPS, FED-X, etc. I'd buy again if I needed another one of these floater frames. 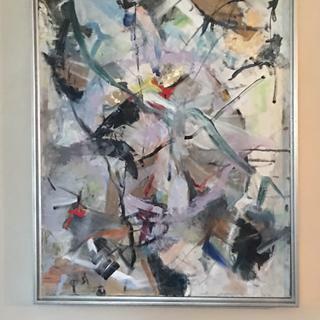 This frame is a compliments my large abstract paints on gallery wrapped canvases with metallic highlights. Hi Toby. Thank you for your review. We regret that you had this experience, however, we are glad to know that our customer care team was able to make things right for you. If there is anything else we can do for you, please let us know. We appreciate your business and hope to serve you better in the future! Brings instant elegance to standard canvas! Delivered timely and in good condition. I love the frame I purchased. It's well-made, and fits perfectly with the canvas. The paint is nicely done. 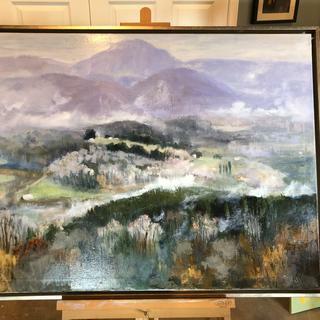 My only suggestion would be to either send along a very small amount of the paint used on the frame for touch-ups or offer a small bottle for purchase. I will continue to purchase this product and have directed my clients to pictureframes.com. Lovely product, have recommended to clients and fellow artists. 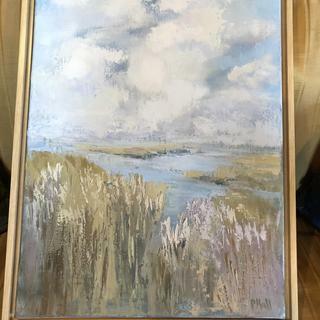 Beautiful, versatile frame, will work with, and enhance many styles of art. It arrived right on time, the craftsmanship was exceptional, all measurements were exact, and the frame itself is extremely handsome, without being in any way overwhelming--just what a frame needs to be! Beautiful and nicer than I anticipated. There were 6 screws missing, so I had to improvise. That was a pain but its fine and up. We have recently updated our canvas floater instructions. It has been a common misconception that there were not enough screws in the hardware packages this was due to the fact that people were placing screws in the hardware going in to the frame. It is only necessary to place screws in the canvas stretcher to properly secure the art work. I hope this helps to clear up any confusion. Thank you for your feedback! This frame was the perfect finishing touch for my gallery wrapped painting. Packing was very well done. Love it! Love this frame and have ordered it in many sizes! My only complaint on this order is that I didn’t receive enough screws and there wasn’t enough wire for hanging. The frame was 60 inches across so I had to add extra wire in order for it to stretch across and have enough to wrap for strength. It's very easy to assemble and looks much more expensive than it actually was. We'd definitely purchase again. The Frame is a perfect compliment to my canvas and easy to install. Love the clean modern look and great quality. Will gitvdute get this frame again! Love the floating frame..could not be happier. Just what I wanted! It was very easy to install the picture inside the frame. The quality was very good makes my Ross purchase look like an expensive piece of art! Instructions could’ve been better, but once I discovered how to fit my canvas in it, things worked perfect. This was a great purchase and it made my artwork look phenomenal!!! Thank you for the excellent service and fast delivery. Its even prettier than the photo.. The frame is perfect and its even prettier than the photo; thank you for fast service and shipment and a top quality product!! Great value for nice quality wood frame. Really highlights my painting and makes it look finished. Beautiful, well made frame! It fit my painting perfectly. I will be ordering more. This frame works perfectly with my hand painted photos printed on metal Instead of a mat I use metal embossing. The satiny silver frame was a great enhancement. It is well made. I did had a service issue with 2 floating frames being chipped in transmit. Their Customer Care department handled this in a very friendly manner and shipped two new frames to me very expediently. I have ordered from them before and never had an issue. They send quality products at a very good price. The frame more than met my expectations. It is beautiful and was easy to install. I plan to purchase several more. This frame is very well made and fit my picture perfectly. I am very please with the quality and the color. It was shipped within the timeline stated and was very well packaged, no chance for damage at all. 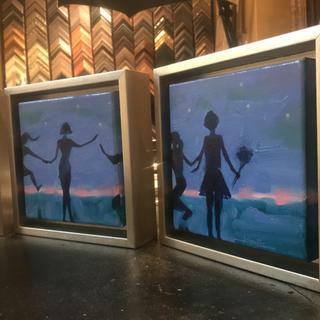 As a professional painter, I've used these frames in silver, white and black. All are great. Although I often show my gallery-wrapped canvases without a frame, some buyers prefer them framed and these are perfect. Only problem is that the oversized shipping charge can be a killer. Susan thank you so much for being a loyal customer. We can understand your concern regarding the oversized carrier fee. Let me assure you that the oversized fees are not profitable to us. We hope to negotiate better shipping fees with UPS in the future. Thank you again for your business. One of my best purchases! It completly changed the look of our painting! 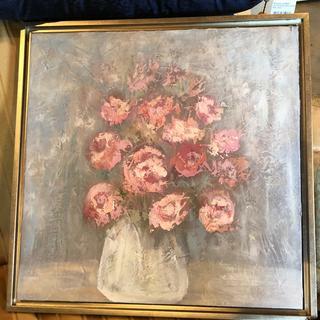 I use this silver leaf canvas floater frame in both large 1/12” and small size for my floral paintings. It has a nice contemporary feel. It lets the artwork shine without competing for attention with the paintings. I have also used the same frame in wood tone for more traditional paintings. I am thrilled with this frame. 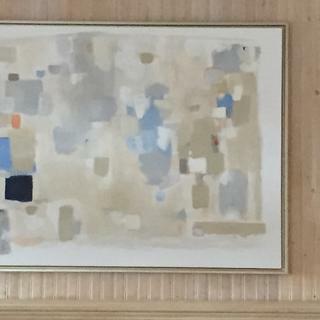 It was chosen to complement a painting (modern art) that my granddaughter provided. It is shown in our family room with pride.......thanking you for quick, superior service. 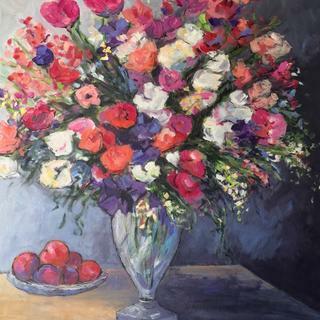 Recently purchased a 36" X 36" original painting and wanted to complete it with a nice frame. This silver leaf canvas floater is absolutely the perfect finish. It highlights the painting but doesn't compete with it. Easy to attach to the painting inspite of the almost useless, enclosed directions that came with the frame. Shipping costs plus the high "oversize" extra charge made the shipping more than the frame but still cheaper than anything found locally. arrived quickly and was exactly as it looks in the photo. Had an a question with installing the canvas and pinged customer service via chat, they quickly pointed me in the right direction. Great frame in quality and ease of mounting my canvas to it. Really happy with frame. Directions for measuring and mounting were great. 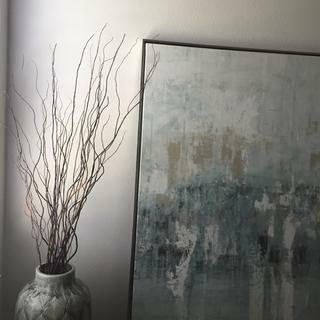 Bought an inexpensive painting. The frame really shows it off. The frame is a beautiful warm toned silver and it compliments the artwork perfectly! I love this frame. It is beautiful quality, and the finish is lovely. Only suggestion: measurements could be more clearly laid out on website specs. 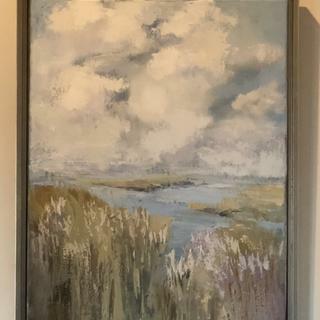 I purchased this frame for a 12 x 12" painting on board (1/4" thick) and there is more space around it than I would like. I had trouble deciding which size to purchase. It would fit better in a frame for 11 3/4" square. (this is because there are two steps in the frame... I need a narrower gap between frame and edge of picture). Frame was shipped in a timely fashion, and very well and safely packaged. Hardware included is just right. Beautiful weight and nice finish. 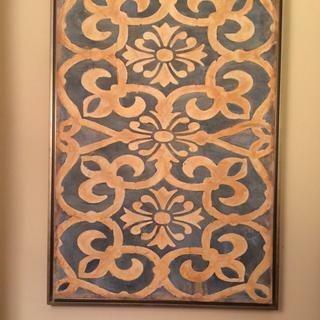 this frame is a perennial favorite - it is very versatile - and shows my mosaic work well. very classy and not overwhelming. I was looking for a flatter frame and wanted something that had a subtle gold cast. Based on the sample I received, this color is a “warm” silver that I would describe as a champagne tone. I ordered a gold version of this frame and it was perfect for my last art piece! 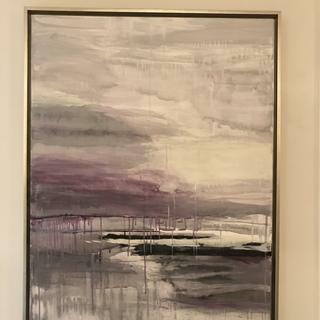 I chose this frame because of the variations in the silver adding to the overall look of the technique I used in my painting. It is simple yet beautiful. Really love the look of these frames for my paintings.... clean, modern and elegant. Very light weight for moving and hanging my art in shows is a bonus. I have been using this color and style for the last few years on all my paintings and always get compliments. Coordinated well with both the wall color and picture. I have used this frame many times and love the simplicity and elegance. It looked "classic, modern and clean" to me. It fits the design in my condo. I'm using it to frame a large wall mirror. I am a repeat customer!! I chose this frame to add the finishing touch to a piece of art on canvas that I just finished painting. LOVED THE QUALITY OF PREVIOUS PURCHASES. THIS IS A SPLURGE FOR A SPECIAL PAINTING I JUST FINISHED. We always like these best for most paintings. The frame really gives a finished beautiful look to your art piece. I've purchased it before and it looks great. I love that it is made in the USA!!! I love the coloring and the depth is perfect for my 1.5 inch deep canvas. I like floater frames and this finish is a little different from others that I've used. Hopefully it will look great on my painting. It will make my canvas jump out of the frame. This looks good with the picture canvas I bought. I've purchased in the past and they are simply GORGEOUS! I loved the color and it goes well with my commissioned piece of my dog. I just order this floating frame.. I picked it because I liked the color. . Hopefully when I receive it, it will be a good fit. 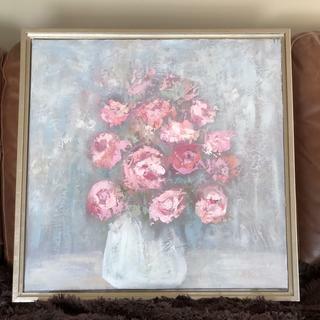 When The frame arrive I will give my review..
My MIL bought this frame for a canvas she painted and it was perfect. She painted a similar canvas for us so I’m ordering as well. I think it will match my art and it has good reviews. The floating frame gives your work a more sophisticated and professional look. I needed a deep rabbet floater in silver to compliment an ocean scene. I think this frame will do the trick, although I have just ordered it and have not yet seen it with the painting. Love the distressed silver finish it really off sets my work beautifully. Framing artwork can get outrageously expensive. 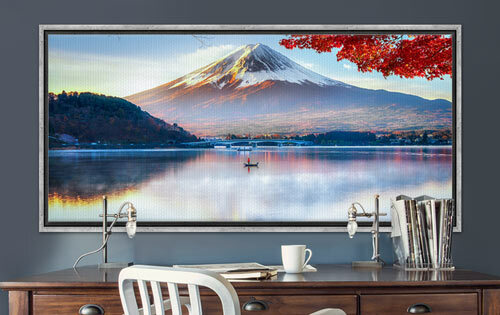 Floating frames with canvas has been done forever for a reason. It looks finished. Now I use them with all my metal prints. I absolutely love the look and it costs significantly less than the alternatives. My canvas artwork is 30"x30" and 1.5" deep. Will this frame work? BEST ANSWER: Yes! I'm a fine art photographer and I print my photos on 1.5" deep canvas with mirrored sides. I use this frame all the time and it always looks great. 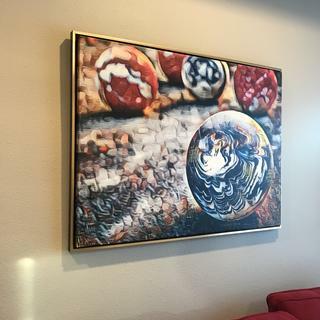 It's super easy to install the canvas and the frame really enhances and grounds the work. I highly recommend it. This frame is would be perfect since it too has a 1.5" deep rabbet. Please let us know if you have any additional questions. Based on my experience, it will be perfect. I have had good success with this frame. It finishes off the paintings beautifully. I’ve framed many canvases and wood panels of this size with this frame. Very good looking! For a 36 x 36, what size should the frame be? BEST ANSWER: Hi- the "float" distance is automatically built into these frames, so you just order the frame in whatever size your canvas is, and it fits. so just order a 36 x 36. hope that helps! H! You always want to enter the exact size of your artwork. We will build the around that size. Happy framing! BEST ANSWER: No, I don't have an assembly video. The frame was shipped, according to my size requirements, already put together. Wiring, screws, etc. were included with the frame along with printed directions for inserting and securing the painting in the frame. It was easy to assemble. What’s the best frame for a canvas the depth of 1.5”? This frame would be an excellent choice for a canvas depth of 1.5". If you have any additional questions do not hesitate to contact our friendly framing experts at 1-800-332-8884 or via LIVE chat Monday-Friday. This frame works well for a canvas of that depth. I buy them all of the time! Do you have a silver leaf frame that will work with a 30"x40" print? BEST ANSWER: Hi Jocelyn. This frame is for canvas only. If your print is stretched on canvas stretcher bars, then we can certainly create the 30"x 40" size for you. Otherwise, we do have print-friendly silver leaf frames, such as the PL8, that will be able to work for you. Hello. 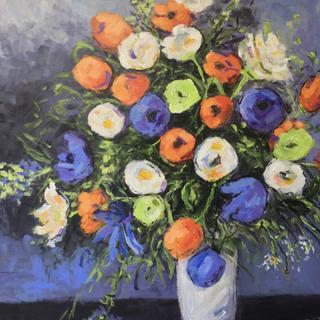 I have a canvas painting that is in centimeters: 76cm length x 61.25 cm ht and 2 cm deep. 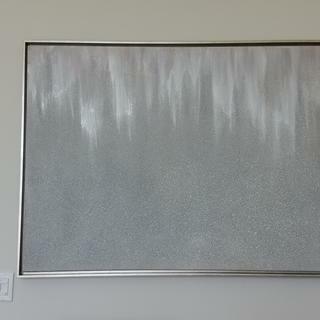 I am looking for a simple silver or silver leaf floating canvas frame that will float the artwork to about 1.5 inches deep. Can you suggest some frames that would work? Thank you. 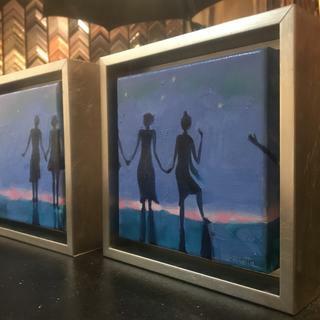 BEST ANSWER: This frame would work fine and our new LUXE silver frame would do well also LFC4 https://www.pictureframes.com/Custom-Frames/Silver-Custom-Frame-LFC4. 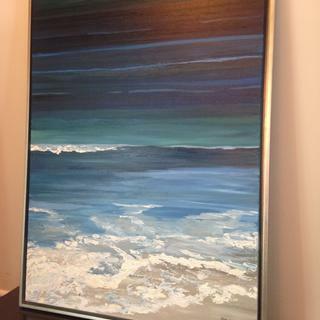 Have 36 x 48 x 1 3/8” canvass and looking for natural or maple color floater frame. Do you have? BEST ANSWER: We do have colors that could work for you. Our care team can certainly help you select the perfect frame for your piece. They are available Monday-Friday 8am-7pm eastern time and can be reached at 1-800-332-8884. Thank you! BEST ANSWER: Hi Martin. We can send the frame unassembled. This would need to be ordered by phone at 1-800-332-8884. Thank you! Our frame has arrived and it's beautiful! We don't quite understand how to use the brackets and screws for mounting our canvas securely? BEST ANSWER: Hi Sally. Thank you for reaching out to us! Our care team is happy to walk you through step by step to ensure a perfect fit. They can be reached at 1-800-332-8884 and are in the office Monday-Friday 8am-7pm eastern time. If I want my canvas to fit a bit tighter in the frame, can I deduct 1/4" from the actual dimension? BEST ANSWER: Here at pictureframes.com, we build your frame to the exact size of your artwork. We recommend speaking with one of our framing experts to determine the best size for your project. They are available Monday-Friday 8am-7pm eastern standard time and can be reached at 1-800-332-8884. Thank you! 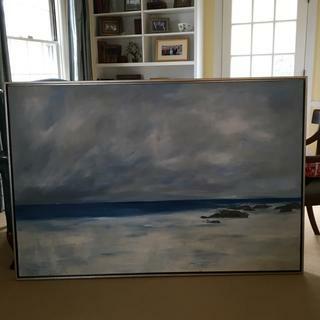 I have a canvas that is 48/60 and is 1 1/2 inches in depth I want a silver metal frame would this work? BEST ANSWER: Hello Lisa! Thank you for your inquiry! 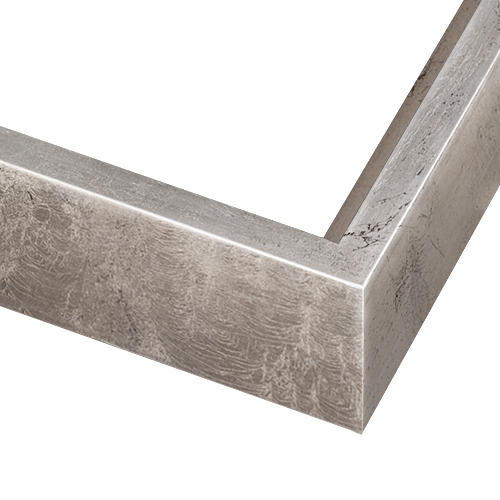 At this time, the deepest Silver Metal frame we have is 13/16" in depth. We apologize for any inconvenience. BEST ANSWER: Hello. The depth of the frame is 1 5/8" which is more depth than you need for a 1" canvas. Please consider the CFS4 which as a depth of 11/16'. Thanks! How do I attach the canvas to a custom six floater frame that has no screw holes? BEST ANSWER: Hello Kathy. This floater frame comes with the L-shaped brackets and screws you need to attach the canvas to the frame. You can use the screws and insert them right through stretcher bars with a drill. Take a look at the video below for a visual. If you need further assistance, please let us know. I have a canvas that is 2" wide. Will the CFL4 silver leaf work with this canvas? BEST ANSWER: Hello! Thank you for your inquiry. The CFL4 is 1 5/8" deep and can be cut to a custom size. If the depth of your canvas is 2", it will work with the frame. However, the canvas will not be flush. If you want to consider another frame, please take a look at our Super Canvas Wood Frames. Let us know if you have any additional questions. Happy Framing! do I have to add i/4" on each side of the size for the frame to float? Also I have a canvas that needs centimeter measurements. It is 45cx55c can you do this? BEST ANSWER: Hello Timothy! Please do not 1/4" to the width and the height of the frame. Please enter the exact size of the artwork, and we will add 1/4" as an 'allowance'. Also, please convert the size from centimeters to inches. If you need further assistance, please give us a call. Thank you for your inquiry! Happy Framing! 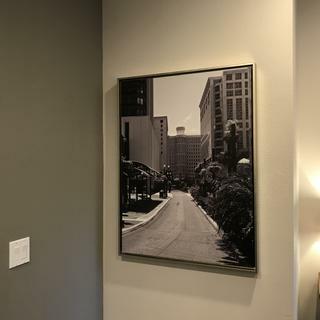 Is this exact frame available in for the 3/4" depth canvas size like the gold one? let me know. BEST ANSWER: Hello Stephanie! Yes, we have this beautiful Silver Leaf Frame available in size 11/16". The sku for the frame I am referring to is CFS4. See the image of the frame below. Have a great day! Could this frame accomodate a 2" frame? BEST ANSWER: Hello! Thank you so much for visiting www.pictureframes.com. 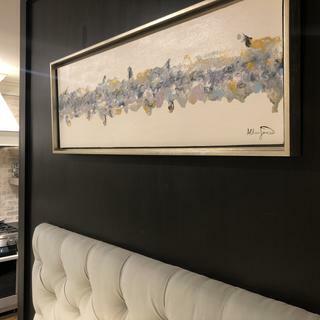 This beautiful Silver Leaf Frame will hold a canvas up to 2" in depth, however, the canvas will protrude out the back of the frame by 3/8". The depth of the frame is 1 5/8". We have canvas clips available which will help secure the canvas inside the frame. The deepest frame we have is a Black Frame with 2 1/2" in depth. This frame is in our Super Canvas Wood Collection. See the image below. In the Super Canvas Woods Collection, we also have a Silver Frame with the depth of 1 7/8". I have also attached an image of that frame below as well. Please let us know if you need more guidance in making a frame selection. Have a wonderful day! Would this work for 3/4" canvas? BEST ANSWER: Hello Christie! Yes, the frame will fit a 3/4" canvas, however the CFS4 will work better. The CFS4 has a depth of 11/16". If you need additional assistance, please let us know.